This picture was taken along the south boundary line of Lot 22. 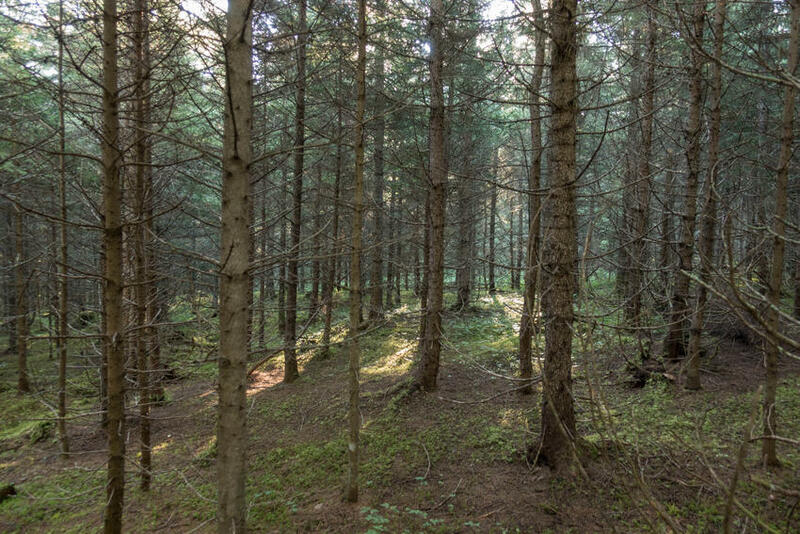 The land is very nicely wooded throughout in good sized evergreen trees. This picture was taken on Lot 22 at Ashfield Lane. Ashfield Land is a private right-of-way from Ashfield Road providing access to your land. Ashfield Road to your land from River Denys. It is about 2 miles up this road from Barren Road in River Denys. 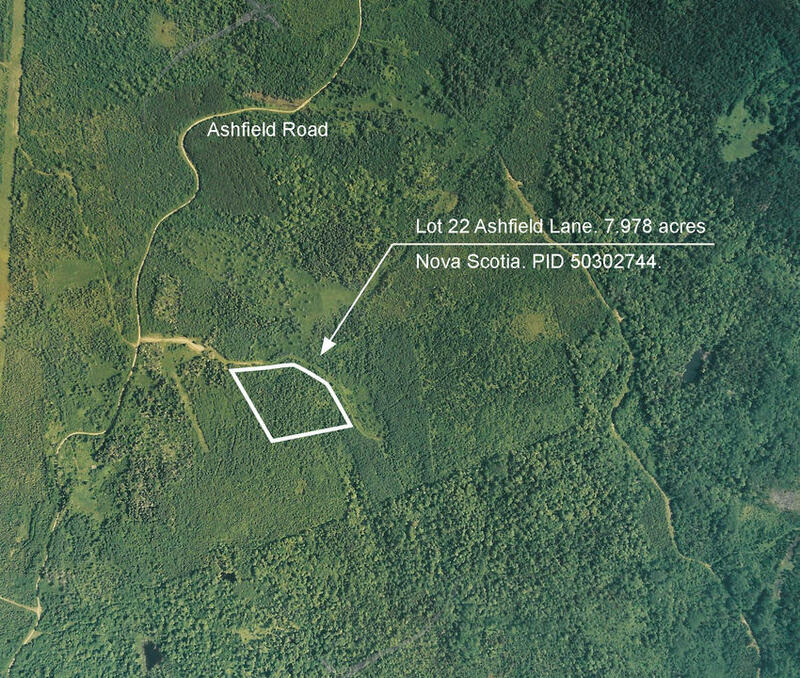 Bird's eye view of showing approximately land boundaries in Ashfield, Nova Scotia. River Denys. Your land has deeded access to the river from Barren Road at River Denys approximately 2 miles away. Kayaking and canoeing and boating with small watercraft is awesome. 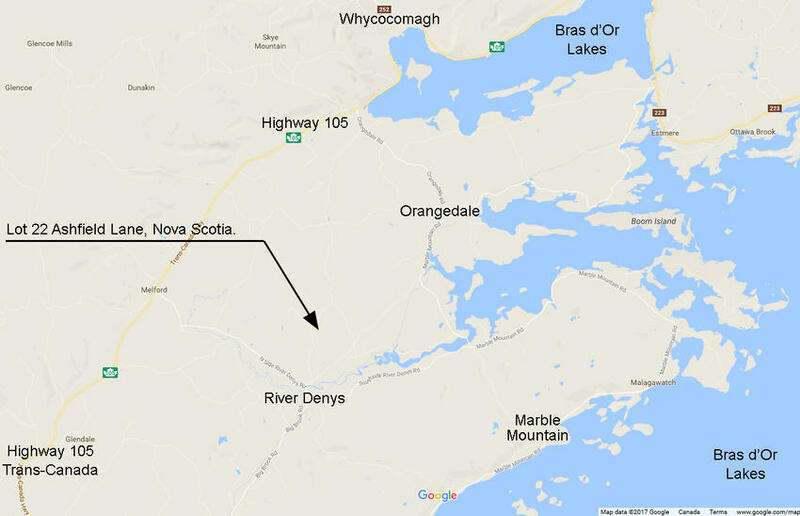 You can reach the Bras d'Or Lake from the deeded access in River Denys. 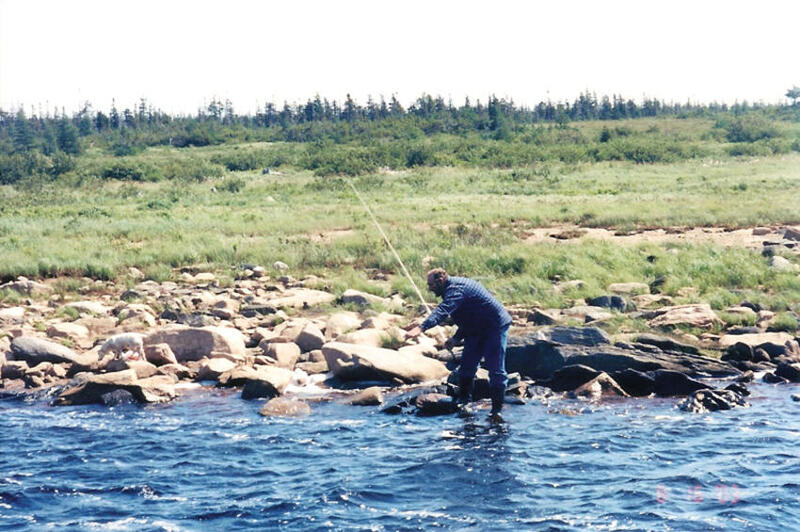 Trout fishing in the Cape Breton Highlands. 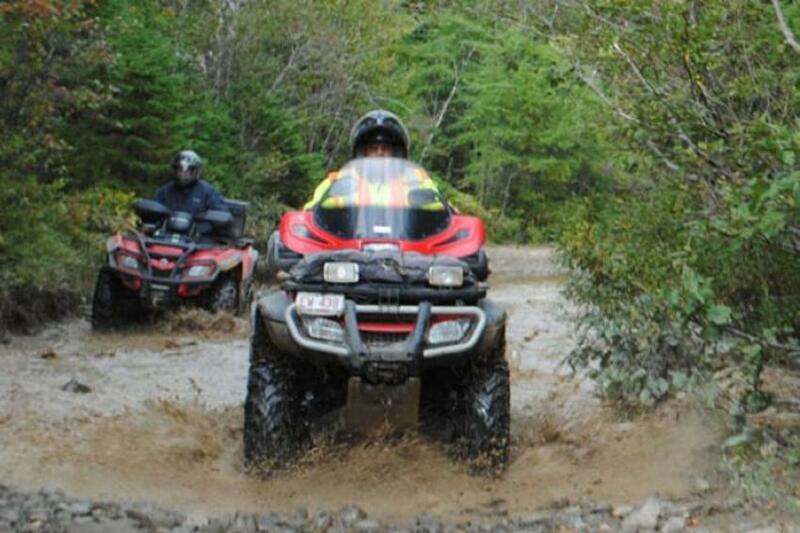 This is a great area for ATV adventures and snowmobiling in the winter. 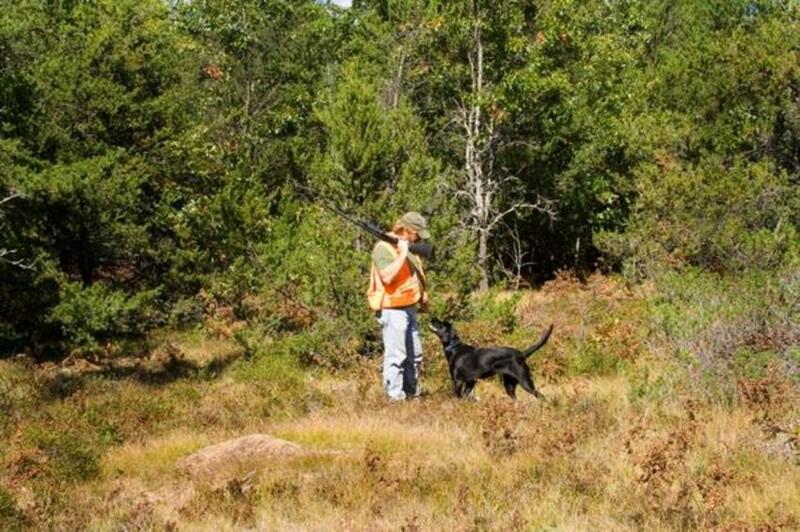 Hunting for small and big game. 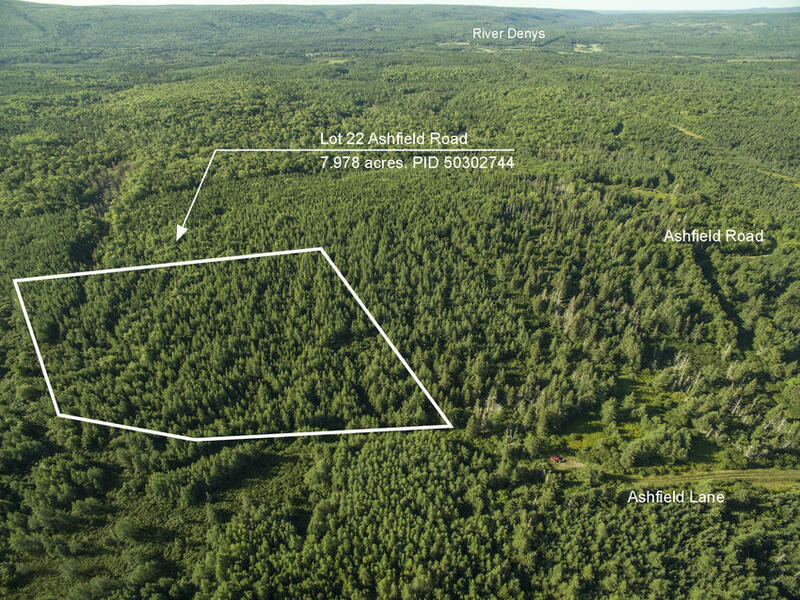 Here is an air photo outlining Lot 22 Ashfield Road Wilderness land. This topographic map indicates the location of your land, Lot 22, as well as the nearby access point to River Denys, approximately 2 miles south of your land. Map indicating the location of your land as well as several nearby towns and communities. 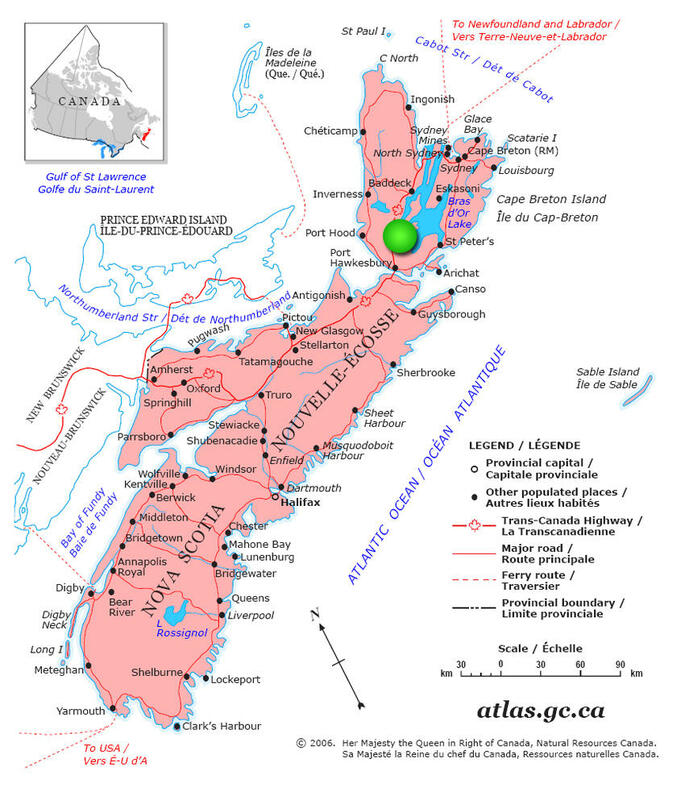 Map of Nova Scotia indicating the location of your land (green dot). 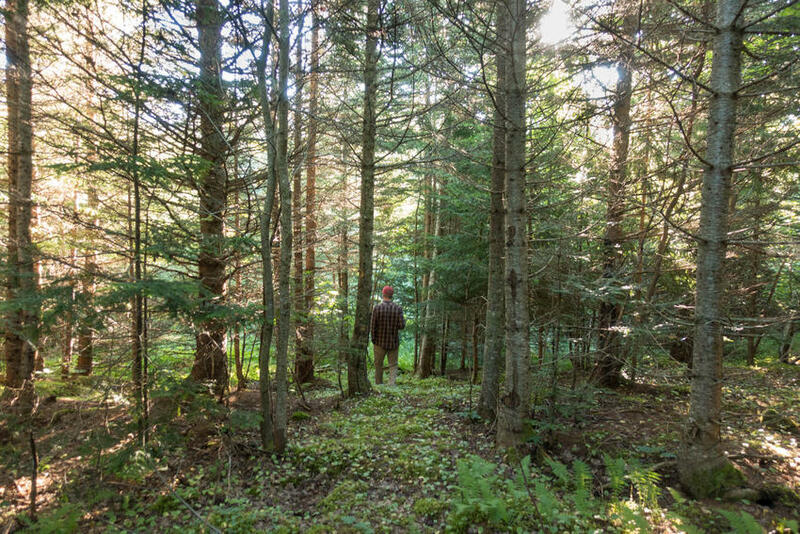 Lot 22 Ashfield Lane Wilderness Land in Cape Breton Nova Scotia. 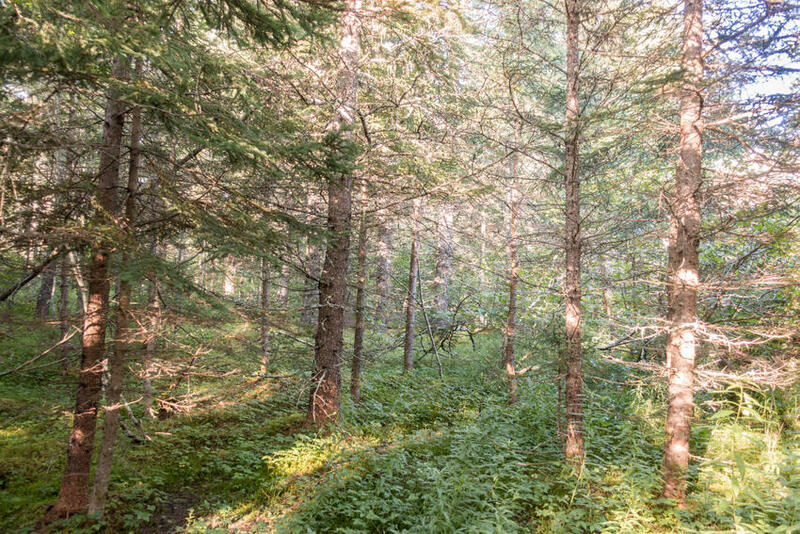 LOT 22 at Ashfield Lane Wilderness lots is a 7.978 acre parcel that is beautifully wooded throughout in evergreen trees - Spruce, Fir, and Hackmatack. The ground is well draining and dry that is more or less level to slightly sloping from North to South and from East to West. The survey on the land is completed and lot lines are clearly marked and easy to walk. The westerly boundary line measures 642.80 feet (195.92 meters). The southerly boundary line measures 621.70 feet (189.49 meters). Northerly and Easterly boundary lines of the property follow the access road Ashfield Lane for 1,076.16 feet (328.01 meters). 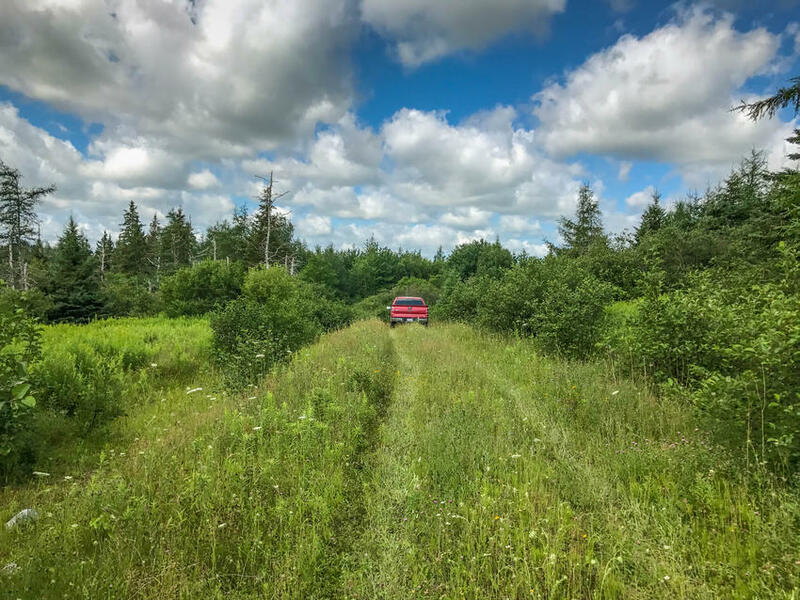 At this time roughly 250 feet of the access road needs to be cleared of alder trees in order to allow access by vehicle. There are many possibilities to clear an area on your land and enjoy it for camping. Here you may build a remote wilderness cabin tucked away among the trees and nature. 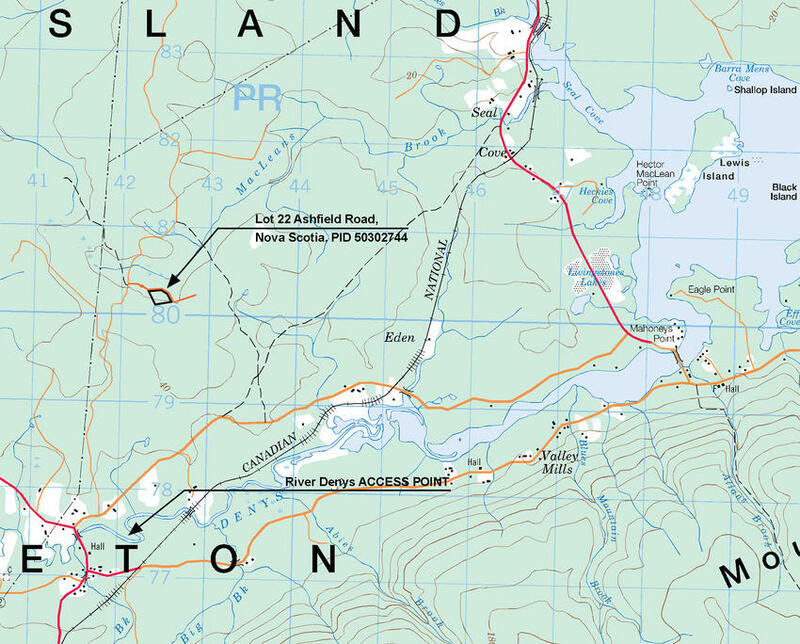 The land is considered remote with access from the small community of River Denys via Eden Road (Government maintained road) and Ashfield Road. Ashfield Lane is a private access road that branches off of Ashfield Road and provides access to your land. This is a fantastic region for hunting small and big game, and for outdoor activities like four-wheeling, off-roading, dirt biking, hiking. In winter months the snowmobiling here is excellent along with snowshoeing, and cross country skiing. The backroads road network towards the communities of River Denys and Orangedale is vast and allows incredible outdoor adventure for you and your family. 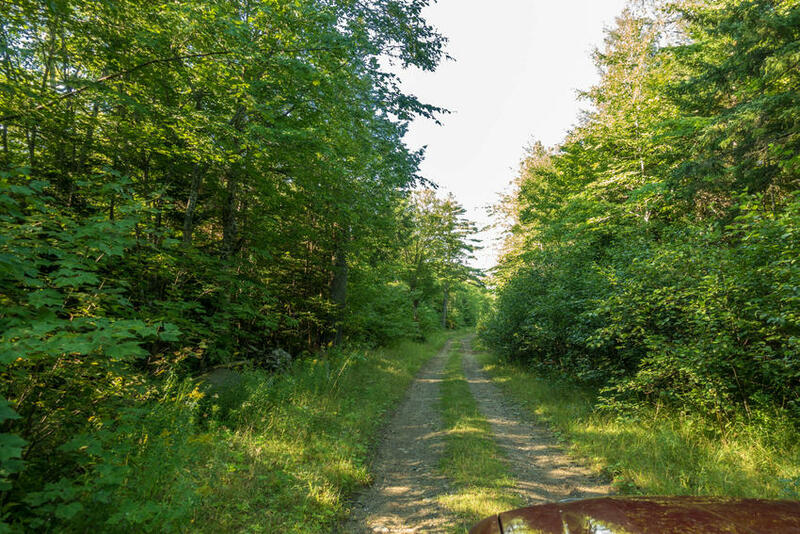 Your land comes with deeded access to the River Denys about two miles away at River Denys and Eden Road. The river features good Trout fishing and endless kayaking and canoeing and small outboard boating adventure possibilities. You can boat right out to the Bras d’Or lake from the water access point. Once you are on the main roads you are within convenient driving distance to several nearby communities with amenities. Baddeck and Whycocomagh are to the North. Port Hawkesbury to the South and Orangedale to the East. Highway 105 north will connect to the world famous Cabot Trail where you can explore the Cape Breton Highlands National Park - hiking, whale watching, sightseeing, spotting moose are everyday experiences up in the highlands. Ocean beaches are easy to reach along the west coast of Cape Breton Island and along the shores of Bras d’Or Lake. Bras d’Or Lake is an 450 square mile area through the heart of the island. Nearly a thousand miles of interior coast-line bordering all four counties and framing in an enchanting succession of wide harbors, island dotted bays, and deep fjord-like channels. Bras d’Or Lake is the largest lake in Nova Scotia. Only 6 inches of tide, no currents and only one-third of the salt content of the open sea makes the Bras d’Or Lake unquestionably the most ideal body of water for all kinds of recreational activities. This land as well as the neighboring Lot 23 are available (click here). A discount is offered for both lots sold together. - This is an ideal location for recreation - Hunting, 4-wheeling, snowmobiling, canoeing and fishing. - Off-grid location offering lots of privacy in a very remote location. - Cell phone service at the lot. - There is a small spring on the land. - Beautifully wooded throughout in Spruce, Hackmatack. - There or no restrictive covenants and no time frame to build. - The annual property taxes are about $120/year. There are no other ownership fees. Sorry this acreage is SOLD. To view more properties similar to this, visit our Nova Scotia property list, here. Automatic financing. On receiving your down payment, you will receive our contract, and after final payment, your full property rights will be legally recorded with the Public Registry of Deeds in Port Hood, Inverness County. Questions? Looking to buy? Call us at the numbers below or use our simple contact form below to obtain answers quickly! Subscribe to our monthly newsletter to receive our newest property listings, and more! "Canadian recreational property markets are considered undervalued and world class and represent an incredible opportunity for international investors"
Copyright 2007-2019 Wolter Land Estates, Ltd. All Rights Reserved.